By the early 21st century computers had become ubiquitous in virtually every British business, large and small. Hard to believe that as recently as the 1970s computers were something of a novelty even in many quite large companies. Even there, an aura of mystique surrounded those who actually worked with them: the specialists hidden away in their almost secret departments engaged in activities such as programming, coding and batch processing. Punched card systems were in regular use and data storage was on large reels of magnetic tape. John McNeil was recruited in 1981 to head up the development of computerised business systems at Paxman. With some gentle persuasion he has kindly agreed to put together for this page a history of this activity during the 1980s and the first half of the 1990s. In the following there is reference to GEC and GEC Computer Services. For those unfamiliar with the history, one should mention that in 1968 Paxman became part of the General Electric Company of Great Britain, headed by Arnold Weinstock. GEC owned and controlled a large number of operating units, Paxman being one, in a wide variety of engineering businesses. After Lord Weinstock retired the helm was taken by George Simpson who brought the business to its knees. The GEC name is no more. The application of computers in the Paxman business was not, of course, limited to its business systems. 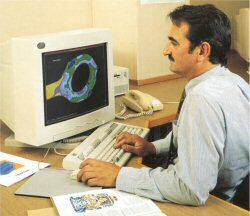 During the latter part of the 1980s and during the 1990s great strides were made in the introduction of CAD (Computer Aided Design) in the Diesel Engine Design and Applications Engineering departments. There was an intention to progress from this to CAM (Computer Aided Manufacturing) but the changing fortunes of the company at the time thwarted that ambition. Computers were also at the heart of the increasing number of CNC (Computer Numerical Control) machine tools acquired by Paxman, about which there is some information on the Paxman Machine Shops page. As with most companies the development of the use of computers at Paxman Diesels followed the development of computer technology and market and company attitudes, dare I say politics, at the time. 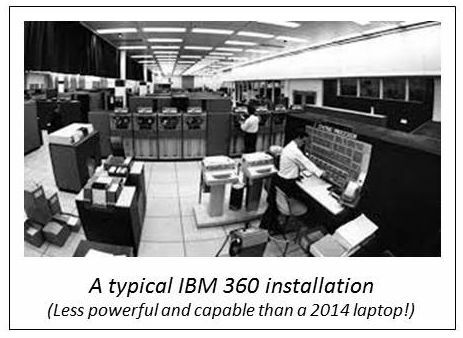 During the 1970s and 1980s the computer market was dominated by IBM (International Business Machines) who were developing larger and larger (by those days' standards) machines on the argument that large was economically beautiful. This encouraged larger companies to centralise their computing facilities and thus their computer expertise. These computers (IBM 360s and 370s) offered batch processing of data which required local conversion of document-based information into digital form, usually by a specialised Data Preparation section for transfer to the computer centre by courier or by RJE (Remote Job Entry) via dial up telephone connection. GEC was no exception and, in spite of its diversity of businesses and a policy of decentralised management and profit responsibility, GEC created a large scale centralised computer facility, GEC Computer Services (GECCS), at The Hollies in Stafford under the management of Bill Northwood … as an independent profit centre. In addition, GECCS developed a 'one solution fits all' system, given the acronym MECCA, which they set out to 'sell' to all GEC companies. In parallel with this The Marconi Company, which became part of GEC, had developed a similar centralised computer facility in Chelmsford under the management of Claude Stokes. The effect of this centralised approach to computing within a diverse group was to separate the solution from the problem, giving rise to frustration and slow progress in the operating companies. It was not until the 1990s that the frustration of local managements and the availability of appropriate computer facilities from manufacturers such as DEC (Digital Equipment Corporation, now swallowed up into Hewlett Packard) that pressure was put on the GEC policy to permit decentralisation of computing. One of the key features of a 'single' product company like Paxmans is the interdependence of its various departments; product design, sales and marketing, manufacturing, after sales, and accounting. All require information from each other, and the efficiency with which information flows can have a significant impact on the success of the company. Before the emergence of computers this was achieved through document based-procedures, very often designed by an O&M (Organisation and Methods) team. In 1980 many such procedures were in operation at Paxman although the O&M influence and expertise had long gone. I understand that the previous Managing Director, Geoffrey Bone, had attempted to promote some computerisation as early as 1957. I have no knowledge of what he proposed but, at that time, computers were at a very early stage and mainly used for technical computing. For example, English Electric Computers had developed the DEUCE computer, employing thermionic valves and machine code, and used it mainly for technical calculation. The only software course I ever went on was in 1959 at Stafford using Alphacode on the DEUCE computer. There were other more commercially orientated computers such as the LEO (developed by J Lyons for his tea shops) but most commercial systems in those days were based on the use of punched cards and mechanical processing thereof. It was not until the mid 1960s that computers such as the English Electric KDF9 and later System 4, more suitable for commercial applications, became available. I do not know what became of Geoffrey Bone's initiative but by the early 1980s Paxman had established a number of 'batch' based computer applications in the Accounting area, including Payroll and cost calculation, and the beginnings of an on-line order processing and invoicing system in the Spares Division using the centralised IBM computing facility at Stafford. I was recruited to join Paxman Diesels in 1981 by Jeff Herbert who had joined the company as Managing Director in January that year. Jeff's background was in the motor industry and he recognised the need to move the company's systems forward. My own background in information systems in various manufacturing companies, including a time in the motor industry and at English Electric Computers, was judged to be appropriate. Out of interest, I served an engineering apprenticeship with Napiers in West London (part of English Electric) which involved a period assembling Deltic diesel engines: an activity which was transferred (from Liverpool) to Paxman at Colchester in 1970! At that time at Paxman there was a 5 strong data preparation section, led by Terry O'Brien, supporting the batch systems mentioned above. The 'encoded' data was prepared on Microdata (previously McDonald Douglas) machines and transmitted to the GECCS centre at Stafford through the telephone line. An analyst, Chris Briggs, was working on the on-line Spares system which was also linked to the GECCS centre. To meet the challenge I headed up a new Business Systems Department. In my experience the tendency was to set up an IT or computer department full of computer experts who speak a different language to the people running the business and expect the business to adapt to fit the computer rather than the other way round. Over the next few years the department was to grow into three main functions, Business Systems Analysis headed by myself, Software Development headed by Mike Pilgrim, and Computer Operations headed by Bob Chatfield. The Business Systems Analysts were appointed to work closely with departmental managers and to 'speak their language'. A 5 year plan was prepared to develop a comprehensive integrated information system linking all functions of the business. A basic specification was put together and the initial thought was to import a software package to run on an in-house computer. All such proposals had to be approved by the Managing Director of GECCS. After extensive negotiation and argument involving Jeff Herbert and Bill Northwood, we were denied that solution in favour of using the GECCS IBM mainframe at Stafford … a very disappointing outcome. In the next year or so, when the foundry on the Colchester site was closed and the space used to build a new semi-automated store for the Spares operation, the Spares order system was developed into a full scale on-line order and stock control system to support enquiry, order processing, stock control, picking, despatch and invoicing requirements. Also during this period the Microdata equipment on site was upgraded to enable some local processing, albeit limited. 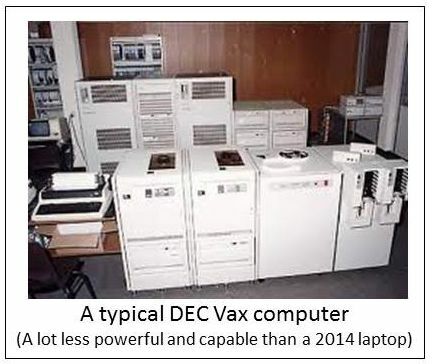 In 1984, after further research, it was decided that, given the opportunity, Paxmans would use DEC Vax computers for local processing. Further examination of the GECCS MECCA system suggested that it would need to be modified extensively to meet Paxman's requirements. It was not until 1986/7 that approval to use the local computing facility for further developments was given and, strangely, I cannot recall exactly how it came about. A computer room was built and the first DEC Vax computer was installed in 1987, providing for the start of the computer-based design and manufacturing information systems. Bob Chatfield headed the Operations team. We standardised on the use of PRO4, a 4th Generation Software Language, which enabled rapid development of a database structure and on-line software routines. Mike Pilgrim headed the software team. The Design Information system was one of the first to be implemented, supervised by Vic Kunz who had joined us from Production management. In parallel with this the designers were progressing with a CAD (Computer Aided Design) system using advanced work stations which, as specialised units, were not connected into the main system. The computer-based Design Information system provided Part and Bill of Material records which provided the essential input to Manufacturing Engineering for the development of production information records which added material and routing information. This latter system provided the basis records on which to found computer-based production work-in-progress, estimating and costing systems, thus providing a high degree of integration in this part of the business. Stan Graham led much of the work in this area. One challenge through this development was the rationalisation of the Paxman part numbering system which was highly significant to the type of part in its structure which, of course, everybody recognised … but differently!! After much debate it was agreed that the 'new' systems would ignore any significance and, in a fairly short time, the benefits of that approach were realised. All of these applications were developed through small teams which brought together the requirements of the departments involved and the opportunities that computerisation presented. All of the systems were operated through VDUs (Visual Display Units) installed in the various departments and connected in real-time mode to the Paxman computer facility. Document printers were installed where required. Thus departments were directly responsible for the accuracy and timeliness of their own information with the result that the traditional Data Prep(aration) section and centralised printing were phased out. The next phase saw the development of Production Stock Control, Work-in-Progress and Purchasing systems. This was followed by a major redevelopment of the Costing and Accounting systems to shadow the transactions in the rest of the system in financial terms. The financial system was itself an integration of several modules which, at the top level, provided the basis for Financial and Management Accounting. In 1992, like most engineering companies, Paxman was under pressure to reduce costs. A few years earlier, in an effort to reduce cost, the Spares order and stock control and related accounting system had been transferred from operation on the GECCS Stafford IBM installation to the similar IBM facility based in Chelmsford; the previous Marconi establishment. Nevertheless, the system was still costing in the order of £1,500,000 per annum and it was proposed to transfer the whole system 'in-house', to operate on an upgraded DEC Vax system at Colchester. A demonstration that this was technically achievable was demanded as part of the justification. A test was set up with DEC in Welwyn, using prototype PRO4 routines, to be witnessed by representatives from GEC Computer Services and Paxman management. Fair to say that, to everybody's surprise, the performance of the trial system exceeded all expectations and the case was made. A point of interest is that one feature of the computer upgrade was the installation of twin disk drives of 1 Gigabyte (1,000 megabytes), the size of a 3 drawer filing cabinet, at a price of £14,000 each. As I write this in 2014 one can buy a 4 Terabyte (4,000 Gigabytes) disk drive about the size of a small toaster for under £200. What in another 20 years? John Furlong, who had been working in other system areas, led the redevelopment in the Spares and Stock Control area. It took over a year to transfer the system, integrating it into the rest of the system and building in some improvements as it progressed, but it was very successful and achieved a substantial cost saving. During this period the number of terminals thoughout the company proliferated, providing word processing facilities for secretaries using a proprietory package called MASS-11 specially developed to operate on the DEC Vax. Even Will Pavry, the Managing Director, had a terminal on his desk. Towards the mid-1990s desktop 'micro' computers began to come onto the market and with them the ambitions of certain individuals in the organisation to have one of their own. While not denying the benefits of standalone computers to support localised requirements, there was a risk that the integrity of the 'integrated' company system would be compromised by diversion of data and priority. Where appropriate and technically achievable, some PCs were connected into the main system. Another reminder that, where politics prevail, the system doesn't work! John Furlong, Hazel Hadgraft, Gerry Ross, Ben Rusbridge, Carl Parkes. During the early to mid-1990s there were further pressures on cost reduction throughout the company and the Business Systems department was not excluded. We had to reduce headcount in all sections and in 1995 I became part of that reduction, retiring at the end of March that year. Although the 5 year plan took more like 10 years to get anywhere near completion, I regard it as a success story and very much appreciate every member of the Business systems team who contributed through the years … we did it together. What happened after that I don't know. It must fall to someone else to continue the story. It seems appropriate to expand on the above with some additional notes about the people who worked in the Business Systems Department (dates in brackets below show period of employment at Paxman) and the work they did. Being employed at Paxman from 1985 to 2000 I had frequent dealings with the Department, not least in the process of recruiting new members of staff to replace those who moved on to seek their fortunes elsewhere. Under John McNeil, who joined the company in 1981 and was a member of the Paxman Management Committee (PMC), the Department wielded considerable power and influence in the business. After John McNeil left at the end of March 1995, Stan Graham was appointed Manager of the Department. When Stan left in November 1997, Mike Pilgrim took on the role until his position was declared redundant in 2002. This was at a time of a major reduction in the size of the Colchester business, following MAN's acquisition of the company in 2000. As previously mentioned, the Department grew to encompass three functions, namely Business Systems Analysis, Software Development and Computer Operations. The task of the Business Systems Analysis section was to examine the various business systems used in the different departments of the company, in close consultation with department heads and their staff, with the aim of improving those procedures for the benefit of user departments and the business as a whole. Individual departments created and collected data for their own purposes but they also needed to receive information from, and supply information to, other departments. The smooth running and good management of the business overall depended on relevant, up to date and accurate information flowing from and to the different departments. The Business System Flow chart shown above illustrates the complexity of an integrated computerised system designed to handle these information flows. The Business Systems Analysts working in this section assessed what items of data should be recorded and how the information could most efficiently be collected, shared and utilised in the business. This included exploring the opportunities presented for systems improvements by advances in computer technology, whether in more sophisticated programming language functions or the rapidly increasing processing power and storage capabilities of hardware at that time. Having designed system improvements, the next stage was to develop the software required to implement them. The section was headed by John McNeil himself. Among the Systems Analysts who worked with him were Chris Briggs (?? - Sep 1983), John Furlong (Sept 1983 - May 1996), Chris Skinner (Oct 1983 - Sep 1987), Ian Stubbins (Sep 1984 - Jul 1988), Vic Kunz (who transferred from Production Management in 1985; 1959 - Apr 1993) and Stan Graham (Mar 1991 - Nov 1997). John Burt joined the section as an Analyst in January 1997, from Material Control where he had been Materials Manager for four years. (Later on this page is John's account of Computerisation in Paxman's Manufacturing Division.) On first joining Business Systems, John supported and specified further development of many of the sub-systems that John McNeil, John Furlong and Vic Kunz had put in place. He also worked with Mike Pilgrim and Paul Goodchild (a very talented programmer who had joined Business Systems from the Spares Department) to ensure that Paxman systems handled the 'date issue' known as the 'Millennium bug' (i.e. to recognise that years '00', '01', etc. were later years than the year '99'!). He was subsequently involved in the major undertaking moving all business systems to SAP. This involved the analysis of data, conversion and mapping to SAP data structures; writing programs to extract and migrate Paxman data to SAP and implementing full Manufacturing Requirements Planning (MRP). The Software Development section was responsible for developing the software required to operate the systems designed by the Analysts. Quite early on, before the installation of DEC Vax computers, a fourth Generation language called PRO4 had been adopted as a standard language. This enabled the fairly rapid development and maintenance of computer programs and the all essential databases which linked it all together. In practical terms the core of the Programmers' work was to write the code for the computer programs, a task calling for a very methodical, logical mind and great accuracy. One wrong character, say a semi-colon instead of a colon, and a program will not work. Again great care is required in coding to ensure that changes in one part of the system do not have unintended, and potentially disastrous, consequences in another module of the system. Good quality coding also calls for an in-depth understanding of the particular programming language being used, knowledge that can take years rather than months of experience to acquire. Writing the necessary code is not the end of the Programmers' task. In conjunction with the Analysts and even users, new or updated software has then to be thoroughly tested to see whether it performs as intended and to identify any 'bugs' which need removing. The section was staffed by computer Programmers, led by Mike Pilgrim (Aug 1985 - 2002). Among the Programmers who worked in the section were Chris Boyce (1981 - 1988), Dave Webb (Aug 1985 - Nov 1989), John Marsters (Apr 1990 - May 1998), Gerry Ross (Mar 1991 - Oct 1997), Paul Goodchild (Jul 1988 - ?? ), Ben Rusbridge (Jul 1989 - Apr 1995) and Maria Porter (1995 - 1999). Computer Operations was responsible for looking after all the computer hardware required to run the company's business systems. This extended from specification, purchase and installation to daily maintenance, troubleshooting and providing technical support to end-users across the site. Operations staff looked after the servers, housed in an air-conditioned room to prevent them overheating, the VDU terminals installed in the many different departments, the network of cabling from the servers to the terminals, and peripherals such as printers. No mean task on a sprawling 23 acre manufacturing site. Being on the receiving end of insistent calls for support could be stressful, each end-user department expecting an immediate response to their problem, oblivious to demands from other departments which might be more critical. Part of the section's daily routine was the making of data backups each evening and taking these off-site so that valuable data would not be lost in the event of fire or other major disaster. Originally, the department comprised a Data Preparation section where four of five ladies encoded, mainly accounting, data for transmission to the IBM computer centre at Stafford. This work was supervised by Terry O'Brien. When the more powerful local processing facilities were installed Bob Chatfield (Jan 1985 - Jan 1999) was recruited to head up the department, ably assisted by Terry O'Brien (1974 - ??). Later Carl Parkes (Jan 1987 - Apr 1995), Steve Edwards (Mar 1995 - Jun 1997) and Steve Riley joined the section. In addition to the above functions, the Business Systems Department supported the 'legal' requirement for documented procedures in the company. Originally this task was undertaken by Jack Peate who had transferred from the Personnel Department where he had been the company's Industrial Relations Manager. In his new role he was later supported by Mike Rowe. I am indebted to John Burt for the following account of computerisation projects undertaken while he was working in the Manufacturing Division of the company. As mentioned above, John joined the Business Systems Department in January 1997 from Material Control where he had been Materials Manager for four years. With overall responsibility for a combined Production/Spares Stock Control, Stores and Spares Despatch, he had been heavily involved in the use of the new Stock Record System provided by Business Systems. Previously he had worked for many years in the Production Engineering Department (PED) where he had been heavily involved in other computerisation projects. Computer Aided NC Programming using APT for CNC Machine programming and MITURN for NC Lathe programming had been introduced many years earlier (APT in 1975 and MITURN in 1978) when John was Section Leader for NC Programming. At that time his team of 6 programmers had 23 NC/CNC machines with differing program languages for which to provide programs. Bearing in mind that every action carried out by a numerical controlled machine had to be written down by a programmer sitting remote from the shopfloor - every table movement, tool selection, cutter-path, spindle speed, tool feed rate, index, clamp/unclamp, etc, etc. in the programming language unique to that machine/control combination - it was very time consuming. The introduction of APT resulted in programs for 3- and 4-axis machine tools being produced in about a third of the time. MITURN for CNC lathes gave even better productivity by reducing programming time to one seventh of the time taken by manual programming methods and resulted in much better quality, more consistent, programs. This in turn helped to reduce machine setting and program prove-out time on the shopfloor. In PED John had been involved in developing the PC-based 'POTS' (Production Order Tracking System) system that was used as a stop-gap in some areas of Manufacturing until the main WIP (Work-In-Progress) system came on stream. The POTS system was used in Nos. 1 and 5 Machine Shops for a while when Colin McAusland (who left in Nov 1985) was Manufacturing Director. A PC-based capacity planning tool called CAPPLAN was introduced in 1984 to enable manpower requirements to be established based on Engine Build, Engine Overhaul and Spares Forecasts. This was used for many years during Management's annual budget discussions. John was made System Manager within PED when Paxman introduced Computer Aided Process Planning (Supercapes). CAPP was introduced because it became apparent that over 400 years of product knowledge and process planning experience was to be lost to the company as a number of Senior Process Planning Engineers reached retirement during the next four years. CAPP was a means of capturing that knowledge before it was too late and, as a computerised system, could be used to provide Routings and Bills of Material information to the MS manufacturing system being developed by Business Systems. Paxman made a major investment in CAD for the design of the VP185. A new CAD system, running Anvil 5000 software, a two-dimensional rather than three-dimensional package, was purchased in 1988. In preparation for the installation of CAD workstations, and to facilitate the necessary cabling, a false floor was built in the Diesel Engine Drawing Office (DEDO). This was located on the second floor of what was the main office block, built in 1954-55 and demolished in Spring 2005. When first installed the Anvil 5000 software was run on networked Apollo workstations. In the mid-1990s the workstations were upgraded with IBM compatible personal computers fitted with 486 processors (of very modest processing power by today's standards). As at December 2012, Anvil 5000 software remained in use at Colchester. There was an intention that the CAD system should be enhanced by the addition of Computer Aided Manufacture (CAM) to create a CAD/CAM system. This would have enabled data from the CAD system to be fed directly into a CAM system, producing the necessary CNC programs for machining components. Unfortunately time and limited resources did not allow plans for introducing CAD/CAM to be realised. From the start of the design of the VP185, Nigel Ramsden, Paxman's Technical Director, had envisaged that advanced computing techniques would be used for analysing stress and predicting performance. This was an innovative step in Paxman's design process which was to prove its worth as the design work proceeded. FEA is a mathematical technique used to evaluate stresses in structures. It involves producing a computer-based model of a structure, and then dividing it up into hundreds, if not thousands of small pieces, known as elements. The purpose of this is that, whilst mathematical relationships simply cannot be developed to predict the behaviour of any shape you care to come up with, relationships can be developed which will reveal how, for example, a brick shaped object will behave. And a solution can be developed by applying relevant constraints, and interactions. For example, if two brick shaped elements A and B are joined to each other, it can be easily seen that, at the interface between the two elements, the deflection under load of brick A must equal the deflection under load of brick B. Photo: Ron Miller doing a stress plot of a connecting rod big end. The software required for finite element analysis does its work in three stages, namely pre-processor, solver, and post-processor. As far as can be recalled, Paxman installed PATRAN for use in each of these three areas. The Patran solver had its limitations, and other solvers were used through the VP185 years. Finally, Patran was discarded and replaced with SolidWorks, which was the first of the new generation of user-friendly solid modellers. Engine performance prediction software was used to model the exchange of gases through the various volumes associated with an engine, e.g. turbocharger compressor, intercooler, air manifold, air inlet port, cylinder, exhaust port, exhaust manifold, and turbocharger turbine. The software is generically known as 'emptying and filling', which basically describes what happens gas-wise to the different volumes during the course of an engine cycle.